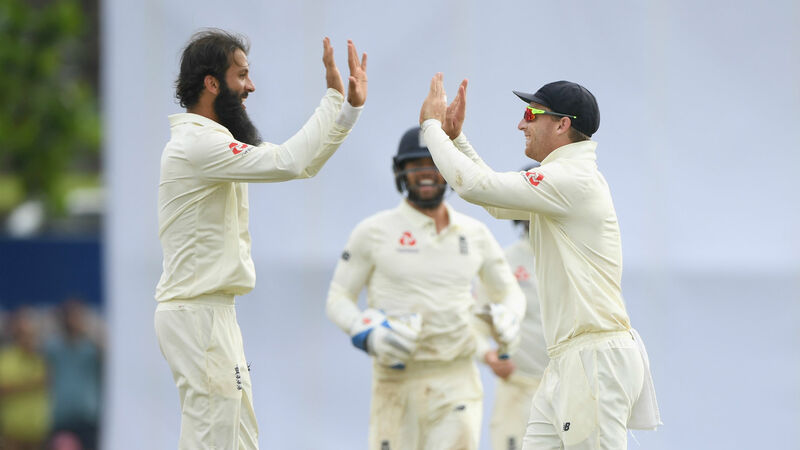 Moeen Ali led the way with four wickets as England raced to a 211-run four-day win over Sri Lanka in the first Test in Galle. Sri Lanka were chasing a massive 462 and, resuming on 15 without loss, they never threatened to come back into the contest on Thursday with no rain forthcoming to save them after an overnight downpour. Instead, Moeen starred as his 4-70 took his match figures to 8-137 and secured England's first away Test victory since triumphing in Bangladesh in October 2016. Jack Leach also weighed in with 3-60, as only Angelo Mathews (53), as in the first innings, caused the tourists any trouble at all. Dimuth Karunaratne (26) and Kaushal Silva (30) kept England at bay for 22 overs - Ben Stokes dropping the former off Moeen - but their partnership of 51 proved to be the biggest of Sri Lanka's second innings. And when Leach trapped Kaushal to make the breakthrough, the wickets started to fall with some regularity, his opening partner gone soon after to Moeen caught and bowled. Stokes took out Dhananjaya de Silva (21) with the last ball before lunch to put England in complete control heading into the afternoon session and more steady progress followed. Kusal Mendis (43) went chasing after Leach to throw away a wicket he had protected so resolutely for a spell, with captain Dinesh Chandimal the next to go for just a single run to the same bowler. Tea provided Sri Lanka some respite, but Moeen laid down a marker with the dismissal of Niroshan Dickwella (16) in his first spell of the third session. And the England spinner finally took the big wicket of Mathews in his next over, sticking the ball in the pitch for Jos Buttler to make a simple catch. Another fine Moeen delivery saw Akila Dananjaya (8) edge to Stokes and then Adil Rashid (1-59) belatedly got in on the act, Dilruwan Perera (30) gone before Rangana Herath was rescued by an appeal after the on-field umpire had the retiring star out first ball. The next review could not save Herath (5), though, as he was run out despite a despairing dive to bring the curtain down on an esteemed career and a fine week for England.